Mike Singer, assistant professor of biology, pursues his interests in biodiversity and environmental conservation through teaching, research, outreach and personal activities. 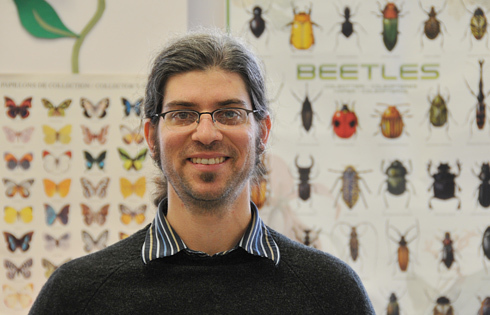 This issue we ask 5 Questions of … Michael Singer, assistant professor of biology. Q: Professor Singer, you are known around campus for being “the bug man,” or more specifically, “the caterpillar man.” What is your interest in entomology? A: I’m generally interested in insects because of their diversity in form, function, and habits. Contrary to many people, I find most kinds of insects quite beautiful. They also have endless stories to tell. I’m particularly interested in a species of woolly bear caterpillar called Grammia incorrupta because of its polyphagous feeding behavior. (Polyphagous means that it eats many different kinds of plants.) Unlike most caterpillars, which have quite specialized diets, this one makes many choices about what it eats, and why it makes those choices is a subject of my research. Q: Please give an example of plant-insect interaction and its role within ecology? A: I study the plant-insect interaction of herbivory (herbivores eating plants). Herbivory is very common and widespread in ecosystems, and most of it involves insects like caterpillars eating plants. Farmers and gardeners know this because they constantly try to keep insects from eating too much of their crop! In natural ecosystems, plants have to rely on other means of pest control. All plants make defensive chemicals to deter or poison herbivores, and most plants also rely on the natural enemies of herbivores, such as birds, spiders, and wasps, for protection from herbivores. This so-called tri-trophic interaction (plants-herbivores-carnivores) is ubiquitous in terrestrial ecosystems. Herbivory reveals the power of evolution because the traits of plants and herbivores change over time, like an arms race, as plants evolve better defenses against herbivores and herbivores respond by evolving countermeasures. It gets even more complicated (and interesting!) when you consider the evolution of the carnivores. The evolution of species interactions, like herbivory and tri-trophic interactions, has probably caused much of the biological diversity we can see today. Q: You received your Ph.D from the University of Arizona, an institution located in a quite different environment than here in Connecticut. How did this affect your research on biology and ecology? A: The physical and cultural environment at U. Arizona was very influential for me as a researcher. The Sonoran Desert of Tucson and its surrounding mountains is a paradise for biologists because it is very biologically diverse with many distinctive and quirky kinds of plants and animals. These characteristics spin many research questions in the minds of ecologists. The cultural environment at U. Arizona fostered interdisciplinary collaboration, and I had the good fortune of working with some outstanding researchers with common interests and varied expertise during my time there. I usually return to Arizona for research at least once a year—typically during our spring break, when Tucson is absolutely gorgeous. Q: What is your interest in biodiversity and environmental conservation? A: I have broad interests in biodiversity and environmental conservation. I pursue these interests through teaching, research, outreach, and personal activities. For me, it started with a very personal interest in “discovering” nature for myself through natural history exploration and that passion led me to my professional activities. So I recommend that students follow their personal interests in biodiversity and environmental conservation, if they have them (and I hope many do!) down paths of accomplishment in academic, professional, or community-service contexts. It’s very satisfying, enriching, and fun, in addition to the hard work. It’s exciting that Wesleyan students now have a greater opportunity to pursue interests in environmental studies in our curriculum through the Environmental Studies co-major program and the developing College of the Environment.